PRINCETON, NJ -- An analysis of Gallup Poll Daily tracking data from the first six months of 2009 finds Massachusetts to be the most Democratic state in the nation, along with the District of Columbia. 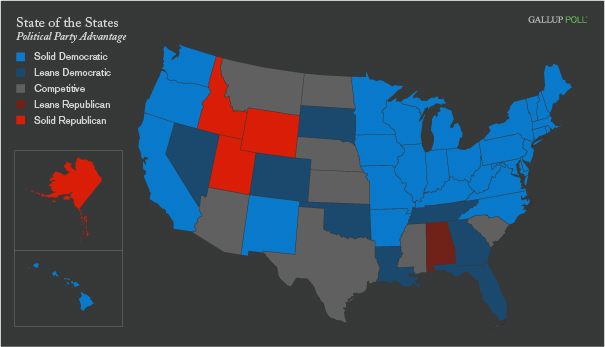 Utah and Wyoming are the most Republican states, as they were in 2008. Only four states show a sizable Republican advantage in party identification, the same number as in 2008. That compares to 29 states plus the District of Columbia with sizable Democratic advantages, also unchanged from last year. These results are based on interviews with over 160,000 U.S. adults conducted between January and June 2009, including a minimum of 400 interviews for each state (305 in the District of Columbia). Each state's data is weighted to demographic characteristics for that state to ensure it is representative of the state's adult population. Because the proportion of independents in each state varies considerably (from a low of 25% in Pennsylvania to a high of 50% in Rhode Island and New Hampshire), it is easiest to compare relative party strength using "leaned" party identification. Thus, the Democratic total represents the percentage of state residents who identify as Democratic, or who identify as independent but when asked a follow-up question say they lean to the Democratic Party. Likewise, the Republican total is the percentage of Republican identifiers and Republican-leaning independents in a state. The accompanying map shows each state's relative party strength (the full data for each state appears at the end of the article) in the first half of 2009, which primarily covers the time since Barack Obama took office as president. States in which one of the parties enjoys a 10 or more percentage point advantage in leaned identification are considered solid supporters of that party. States with between a five- and nine-point advantage are considered leaning toward that party, and states with less than a five-point advantage for one of the parties are considered competitive. As was the case in Gallup's analysis of 2008 yearly data, most states are currently Democratic in their party orientation, with the greatest number (30, including the District of Columbia) classified as solidly Democratic, with an additional 8 states leaning Democratic. Meanwhile, only four states can be considered solidly Republican -- Utah, Wyoming, Idaho, and Alaska, with Alabama falling into the leaning Republican category. That leaves a total of eight states that are competitive in terms of party identification, with none showing a party advantage of greater than two points. These include Mississippi (+1 Republican), North Dakota and Nebraska (even), and Kansas, Arizona, Texas, South Carolina, and Montana (all +2 Democratic). It is important to note that these categories only apply to a state population's party leanings and are not necessarily indicative of a party's electoral strength in that state. Election outcomes are decided on party support (which, as shown here, typically shows a Democratic advantage) but also turnout among party supporters (which typically works in the Republicans' favor). The party strength totals for the first half of 2009 are similar to what Gallup reported earlier this year based on 2008 data. Compared to that report, there has been a net gain of two leaning Democratic states and a net loss of two competitive states, but no net change in the number of solidly Democratic, solidly Republican or leaning Republican states. However, despite the lack of net change, a total of nine states did shift from one category to another when comparing their classification based on 2008 data to their classification based on early 2009 data. Most of the movement was into or out of the competitive category, though two states (Colorado and Nevada) moved from a solid Democratic to leaning Democratic positioning. Since Obama was inaugurated, not much has changed in the political party landscape at the state level -- the Democratic Party continues to hold a solid advantage in party identification in most states and in the nation as a whole. While the size of the Democratic advantage at the national level has shrunk in recent months, this has been due to an increase in independent identification rather than an increase in Republican support. That finding is echoed here given that the total number of solid and leaning Republican states remains unchanged from last year. While the Republican Party is still able to compete in elections if they enjoy greater turnout from their supporters or greater support for its candidates from independent voters, the deck is clearly stacked in the Democratic Party's favor for now. Results are based on telephone interviews with 160,236 national adults, aged 18 and older, conducted Jan. 2 - June 30, 2009, as part of Gallup Poll Daily tracking. For results based on the total sample of national adults, one can say with 95% confidence that the maximum margin of sampling error is ±1 percentage point. The margin of sampling error for most states is ±3 percentage points, but is as high as ±7 percentage points for the District of Columbia, and ±6 percentage points for Wyoming, North Dakota, South Dakota, Delaware and Hawaii. The Gallup-Healthways Well-Being Index reveals that among adults who have health insurance, 29.0% currently rely on a government program, specifically Medicaid, Medicare, or military/veterans’ coverage, while 56.5% say their coverage is through their employer or union. Gallup's initial reading on the 2010 midterm elections shows registered voters favoring the Democratic candidate over the Republican by 50% to 44% on the generic congressional ballot. Given the typical differences in party turnout, the election would be a tight contest if it were held today. Less than half of Americans (44%) believe that a new healthcare reform law would improve medical care in the U.S., while about a quarter (26%) say it would improve their own healthcare situation. Americans are also more likely to believe reform would increase rather than decrease costs nationally and personally.